Maybe for florida beach/dune BAJA? Lil Pepè wrote: Jeep not only better than walking but has its own sub-culture. The people not waving back they dont understand the sub-culture part. But i thought it was "a Jeep thing. I wouldn't understand". I get it and I drive "Jap things"
I used to wave at all jeeps, but the only people who would always wave back were other xjs with lifts and such.. So now they are the only ones i bother waving at. Besides, half the time when im driving around by myself im too busy flipping people off telling them to move out of my way. 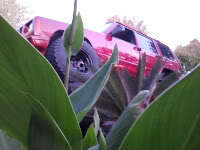 Hellbilly wrote: I used to wave at all jeeps, but the only people who would always wave back were other xjs with lifts and such.. So now they are the only ones i bother waving at. Road rage is an aggressive or angry behavior by a driver of an automobile or other motor vehicle. Such behavior might include rude gestures, verbal insults, deliberately driving in an unsafe or threatening manner, or making threats. Road rage can lead to altercations, assaults, and collisions which result in injuries and even deaths. It can be thought of as an extreme case of aggressive driving.